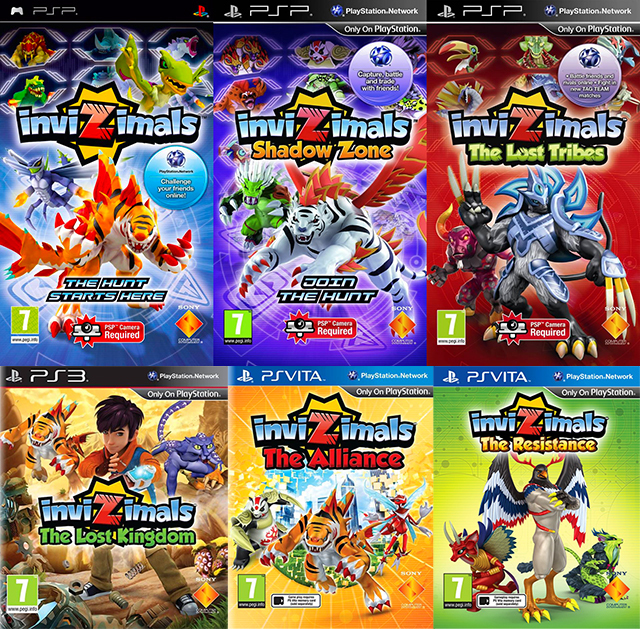 Invizimals: has anyone else heard of this game? It's story time boys and girls! And mind you, this was back in 2010, I was still very young, and PokÃ©mon Black and White wasn't a big thing where I lived (at least, not in middle school+Junior high). So I was curious as to what it had in store for me, and boy, was I in for a surprise. To put things simply, it's sort of like PokÃ©mon, but then again it isn't. It's a game series drenched in cheese, with live action actors who are WAY too enthusiastic about this for it to have the "real life" immersion that it tries to give you. That, and the fact that you capture creatures using different methods, like yelling into the PSP, or whistling. For me, the game worked fine in singleplayer mode (but I grew frustrated having to wait certain times of the day to catch certain ones) but multiplayer was a different story. The game can go from fair to unfair in a matter of seconds when you realize you can't get every Invizimal unless you have friends with the game, or if there are people online. As it turns out, the few people online at the time were complete scum, they utilize glitches to steal 3 of your hard earned creatures and you get nothing in return, one offered poor trades for rare invizimals, among other things. To make matters worse, if you want the invizimal from connecting online, you need to win 10 fights against other players, Great! except if you win a fight, the opposing party can just quit when they lose, meaning you don't get a victory against them, and you can bet your invizimal on the match to force them into playing fair (as they'll lose theirs permanently if they quit), but even then they break out their most powerful invizimal that can't be destroyed. And I thought some kingdom hearts fans were toxic! this game series is based on top of a nuclear plant! Whew, sorry about that, had to get that off my chest. One other thing to note about this game is that it beat PokÃ©mon in terms of having full 3D models. This isn't that much of a shock considering the PSP's greater power compared to the DS. Not only that, but the game is even more watered down than some earlier pokemon titles, you can get mutants in this game (the Invizimals variant of shiny PokÃ©mon) easily, I believe it's a 1 in 20 chance (easier than 1/1,2655 chance that's for sure). Finally, there are only 7 types in the entire game, and they're nothing out of the ordinary when it comes to games like this (seriously, the first elements that pop into your head are the right ones). I played through the sequels of the first one and to my knowledge, am the only person in North America with copies of these games. Only 2 of the games covers are in English, the third one being written in Italian. The fact that the third one is printed only in Europe leads me to believe that other people across the globe have this series, and maybe it's as big as pokemon is in Japan over there. What I want to know is if anyone else heard of this series, whether they saw it, owned it at one point, anything, I'm curious. And I wouldn't advertise these games as good in my opinion, If you're looking for a cheesy gaming experience with basic rules and fair combat, this is it. However, if you want a good story with likable characters and a more defined creature roster, then maybe stick with PokÃ©mon. Let me know if you've heard of this series, it's dead over here. This series is mostly just popular in southern Europe. Few have been released in North America and almost all of them digital only at that. Well, all interest is basically dead in North America, most of these days everything's just focused towards other franchises. I guess they try to target markets where they know they'll get some sales, but those areas are often small and likely won't receive much publicity compared to big names. I guess that's how games like these become hidden, few people know about them in certain areas, but aren't likely to branch out.